Standard airworthiness certification is the most common type of airworthiness approval. The FAA regulations do not allow an aircraft to be operated without some type of airworthiness approval. Once the certification is complete, a standard airworthiness certificate ( FAA Form 8100-2 ) will be issued. Federal aviation regulation (FAR) 21.183 lists the basic requirements for standard airworthiness certification. Newly manufactured aircraft, used aircraft, and aircraft imported from a foreign country must meet the applicable requirements of this regulation. FAA Designees have the final responsibility for determining if an aircraft meets the requirements for standard airworthiness certification. They will inspect the aircraft and review the maintenance records to the extent necessary for them to determine if it meets those requirements. Once issued, a standard airworthiness certificate remains valid as long as the aircraft maintenance is performed in accordance with FAR parts 21 43 and 91 . 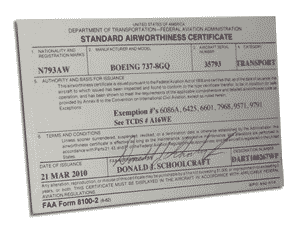 Any airworthiness certificate issued to a U.S. registered civil aircraft must be displayed at the cabin or cockpit entrance so that the certificate is legible to passengers or flight crew members. 1. The first step in the airworthiness certification process is to register the aircraft. This is done by filling out an aircraft registration application, AC Form 8050-1, and submitting it to the FAA registration branch in Oklahoma City, Oklahoma. You cannot download this form, so you must obtain the form from your nearest FAA Flight Standards District Office (FSDO). 2. Once registered, an application form ( FAA Form 8130-6 ) must be filled out. Only the registered owner or his agent can make application for an airworthiness certificate. You can download the application and find instructions on how to fill the form out in the forms section of this website. 3. Then you need to arrange for the aircraft to be inspected. Used aircraft are required to be inspected in accordance with the performance rules for a 100 hour inspection as set forth in FAR Part 43.15. This inspection must be performed by a U.S. certificated repair station (foreign or domestic), the holder of a U.S. mechanic certificate, or an air carrier operating under FAR Part 121. If the aircraft is new, this inspection is not required, but the FAA will require conformity documentation to prove airworthiness. 4. You should assemble all of the aircraft's records in an organized easy to review format. You can download our inspection checklist to help you in doing this. Preparing your records as explained in the checklist should save you time and avoid potential problems when the DAR arrives on site. 5. The next step is to contact a Designated Airworthiness Representative (DAR) to make an appointment for a physical inspection of the aircraft and a review of the records. The DAR will identify any areas that require further information and/or require further action in order to meet the requirements. Usually, they will offer possible solutions to correct the discrepancies noted. (i.e., records accuracy, aircraft discrepancies, modification approvals, etc. ), making it difficult to say the exact amount of time it will take for any given certification. However, the DAR you select should have a good idea of the time it has taken on similar projects and give you a reasonable estimate. 7. The final and most important step - Once an airworthiness certificate has been issued, you need to keep detailed and accurate records of all maintenance performed on the aircraft ( continued airworthiness ) and have those available to the FAA or next owner / operator of the aircraft. Proper recordkeeping is absolutely vital in maintaining the value of any aircraft.